A misty morning sunrise over the now leafless forest. Nice way to start the day. Thanks Jodi, Hope your day is treating you well. It was a great way to start the day I just wish I could roll out of bed early more often. Thanks for the feedback and I hope you are having a great day. Thanks, hope your day has been a great one. Thanks Susan, sods strange but it had all the right colors to make a interesting BW conversion. 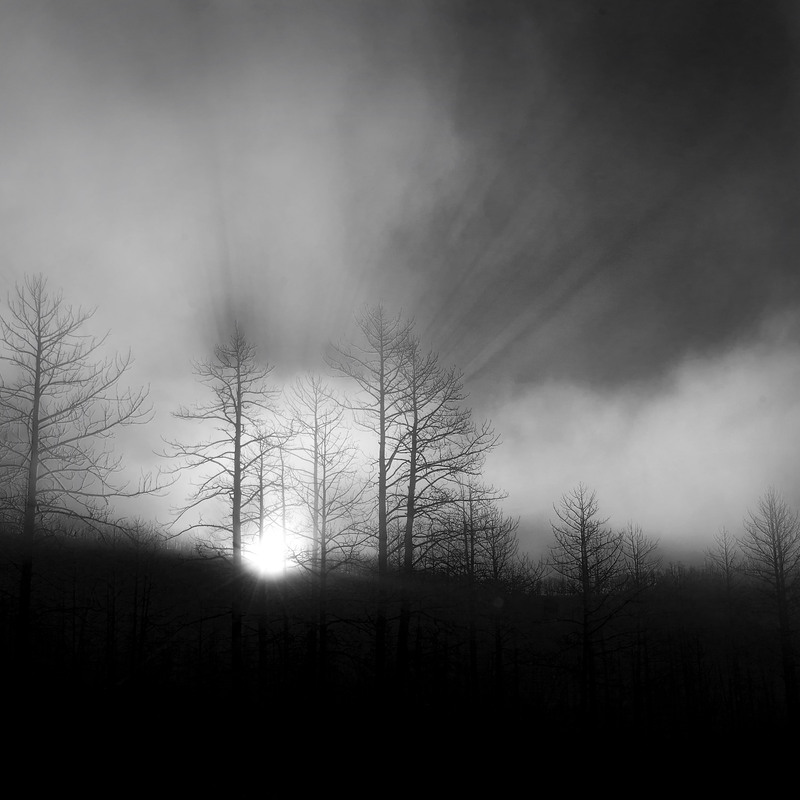 Beautiful black and white sunrise. Usually we’re too intent on capturing the colors. Hi Ken, it looks good in color too but it just begged to be converted to BW. Hope you are having a great day. Hi, being able to stimulate two emotions with a single photo probably is what gives this one strength and makes it interesting. Thanks for the feedback it is valuable and maybe this multiple emotion idea is something I can stove to work on in the future. Stunning! I love the mood created here. Thanks Laura, it is always fun when we can represent a mood in our photography. Hope you are having a great day. You’re so welcome! I love that too… Trying to create a mood. You definitely succeeded here! Thanks Tammy. Hope you are having a good day. Thanks, it was just one of those days when you see an opportunity and take it. Hope your day is going great. What a beautiful mood you’ve captured in this photo-fabulous. Thank you. Thanks for the thoughtful feedback and I am glad the mood came across in the photo. Although I converted to Bw the image does represent the mood I felt and am glad you could feel it. Hi and thanks. Hope you a re doing well. Thanks, hope your day was good and tomorrow is great. Thanks and same to you, have a great weekend. Thanks and I will have a great weekend, snow in the hills and warm down below makes for a fine weekend. Very rarely do I associate the word ‘breath-taking’ with gray-scale. This was surely one of those exceptions. Thanks for the feedback we are humbled by it. Hope you have a great weekend and again thanks for taking time to give us your thoughts as we appreciate it. Thanks Dave, hope you are having a good weekend. Really enjoyed your blog and photos, especially this one. Thank you for sharing! Hi and thanks for the feedback as we really appreciate it. Hope your day is going great. Thanks, hope your day is going great. This works really well in B&W – full of atmosphere. Thanks Noeline, This one just felt right in the BW mode. Thanks again and have a great day. The spirit of the morning – awakening us – incredible. Thanks for the thoughtful feedback very nicely said. Hope your week is off to a glorious start. Thanks Pete, one of those nice moments when you are just driving along and the opportunity presents itself. Yes, its great when things like that happen, especialy when you pull off a great image like that. I’ll join with the others in appreciating your dramatic photograph. Why were the trees leafless in mid-August? Hi Steve, well I had taken a week off from positing new material so this was a re-run of a post that first appeared in the fall a few years back. Ah, that explains it. You haven’t moved to the southern hemisphere after all. I am little curious to know about this photography. How you composed it, camera setting (especially to capture these beautiful sun rays) and any post processing? I will be pleased to hear. Hi Beeren, the composition was mostly just take a quick shot as the sun came up over the ridge and into the fog. The camera was set on f16 and 1/200 sec shutter. It was converted to BW in lightroom with some adjustments in levels and sharpening in photoshop.